With the support of the Arts in Mental Health Coordinators working for the NHS Leicestershire Partnership Trust, we set about working on two wards in two different locations with two different people leading the sessions. The impact and success of the project have been significant and we are already seeking further funding to pilot similar work targeting older people with mental health conditions, including dementia. Fingers crossed! Our heartfelt thanks go to Clare Miles and Rowena Williams who delivered such lovely, inspiring work each week for fifteen weeks over the course of the project. 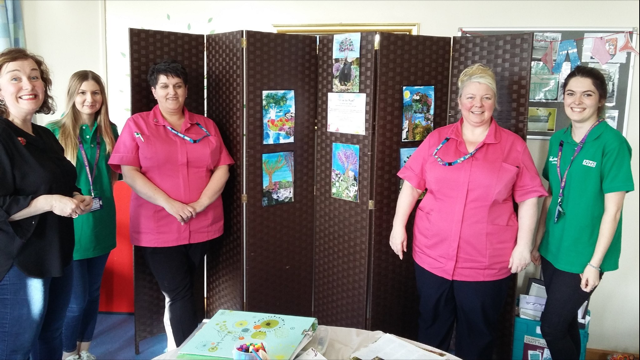 The photos of people engaging in learning, the quotes from older people and staff and the photographs of the artwork produced show the value of artistic learning interventions for older people recovering in hospitals. Both Clare and Rowena have a wealth of experience in working with stroke patients, dementia and those recovering with L4A but also as a nurse and a speech and language therapist respectfully.